The basic circuit for the Morgan chopper is shown in the figure A. The SCR T1 is main SCR whereas diode D1, capacitor C and saturable reactor SR makes commutation circuit for the SCR T1. The exciting current of the saturable reactor is neglected. When SCR T1 is switched off, the charging of capacitor is done through (+)Vdc – C – SR – LOAD – Vdc (–) path and saturable reactor is in positive saturation. When SCR T1 is switched on, the voltage across capacitor appears across saturable reactor and core flux flows from positive saturation to negative saturation. The voltage across capacitor remains constant until core flux reaches at negative saturation. When the core flux reaches negative saturation, the discharging of capacitor is done through (+)C – T1 – SR – C(–) path. The capacitor and saturable reactor makes resonance circuit and its discharge time is equal to π √ LsC. The Ls is inductance after saturation. 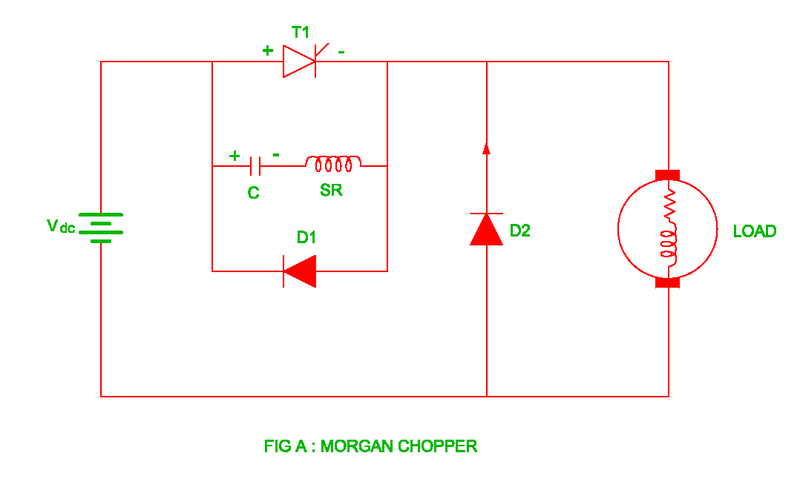 Therefore the discharging time of capacitor is less than the charging time of capacitor. The voltage across capacitor becomes – Vdc is very short time and this voltage appears across saturable reactor. 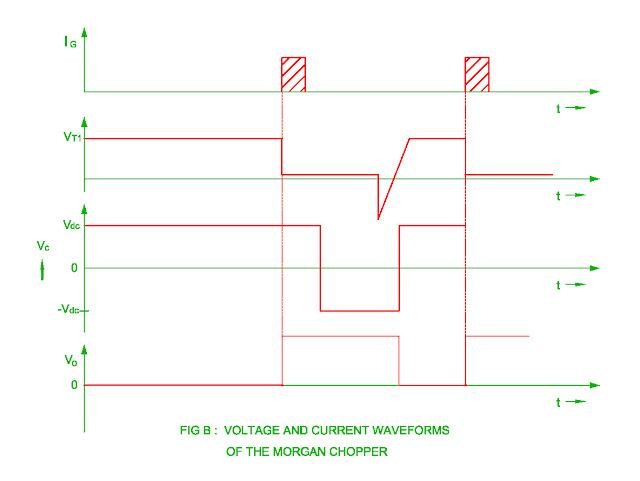 The discharging of capacitor is done through SCR T1 and inductance after saturation in the reverse direction when the core flux reaches in the positive saturation. As this discharging current passes through SCR T1, it will switched off SCR T1 and forward biased diode D1. When SCR T1 is switched off, the load current passes through freewheeling diode. The turn on time of the SCR T1 always constant due to constant time of core saturation and it depends upon √ LsC. 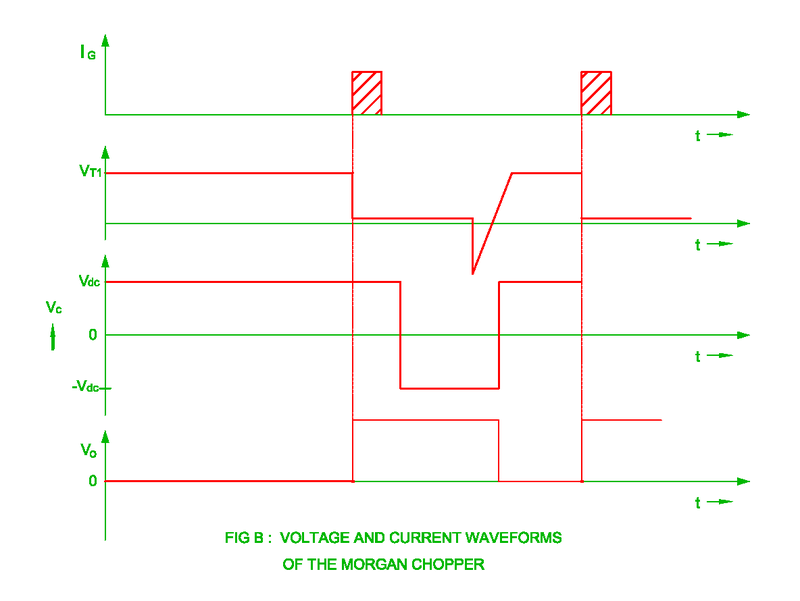 The average output voltage can be changed by changing only output frequency. The turn on time of the SCR is equal to time for positive saturation to negative saturation and again positive saturation of the saturable reactor. The inductance of saturable reactor is low at capacitor charging time and SCR turn off time. The inductance of saturable reactor is higher at SCR turn on time. Low cost of circuit due to only one SCR.